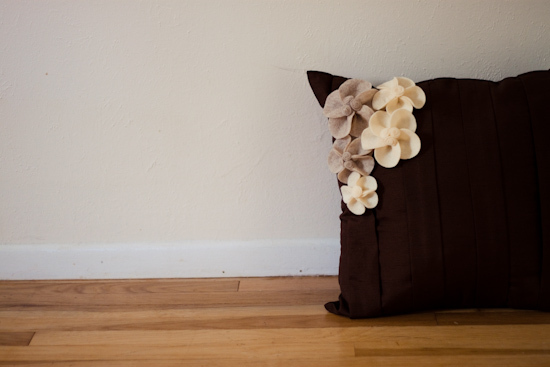 Have any old boring throw pillows laying around? If you answered "yes" then you may want to take a look at this tutorial. 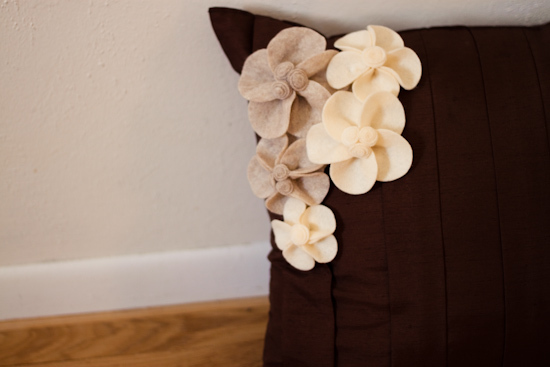 Handmade felt flowers are a perfect way to add a little character to your old throw pillows. Not only are they fun and charming to look at, they cost next to nothing (felt is only about 25cents per sheet)! 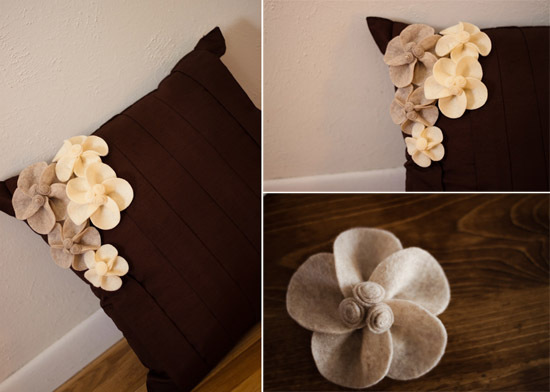 This tutorial will show you how to make a felt flower pin to dress up your old shabby pillows. The pin is super convenient because it can be easily removed and replaced. 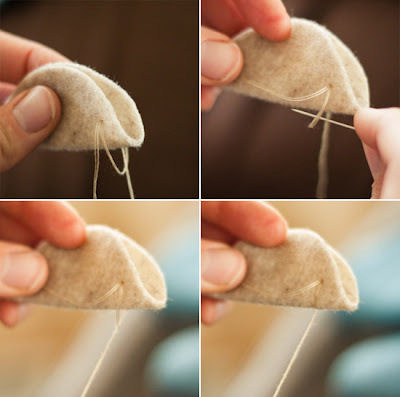 Click below for a step-by-step tutorial! 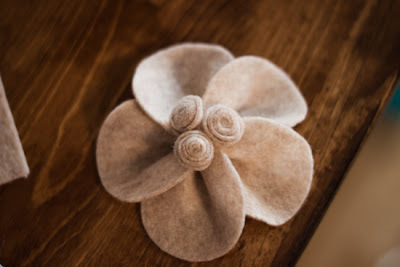 Note: The tutorial for this project will show instructions for the largest felt flower (seen on the upper left hand corner of the pillow) If you want to vary the sizes of your flowers simply adjust the measurements I give to fit your preference. 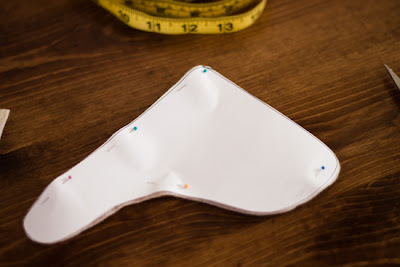 The largest flower begins using 2-3/4" wide squares and the smallest flower (at very bottom of pin) begins using 1-1/2" wide squares. Step 1. 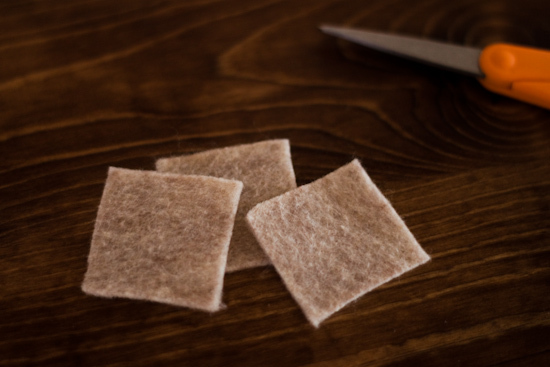 Cut out 5 squares of felt 2-3/4" wide. 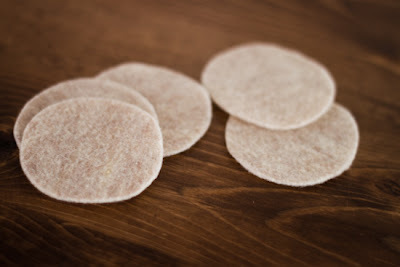 Then cut each square into a circle by rounding off each corner of your square. Don't worry if the circles aren't completely perfect you wont be able to tell once your flower is finished. Step 2. Take one of your circles and fold it in half, like a taco. 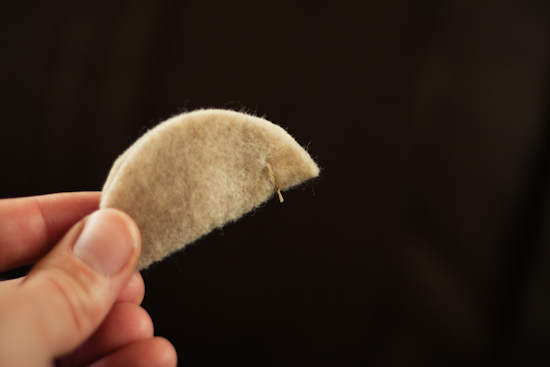 Take your threaded needle through the felt circle (about 1/4" away from the end of your taco). Step 3.Take your needle back through the same spot, this will create a loop in the thread. 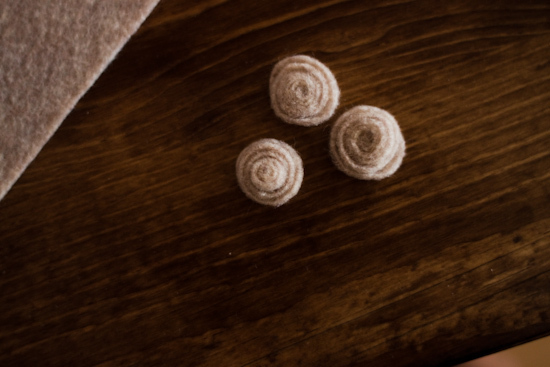 Take your needle through the loop, then pull thread tight. 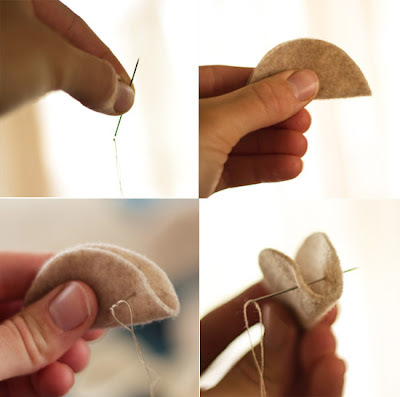 Repeat this step about 3 times, looping your needle through the same spot. Step 4. 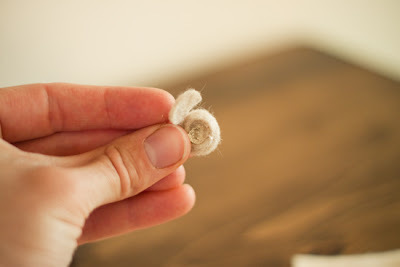 Cut the ends of your thread and tie off. Step 5. Repeat these steps with all 5 of your circles. 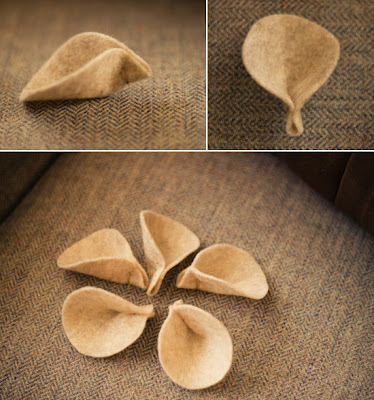 You will end up with 5 puckered flower petals. Step 6. 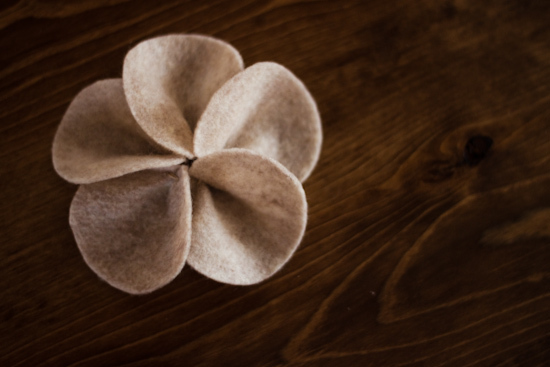 Cut off the ends of each petal, this will allow the petals to lay closer together once your flower is assembled. Step 7. 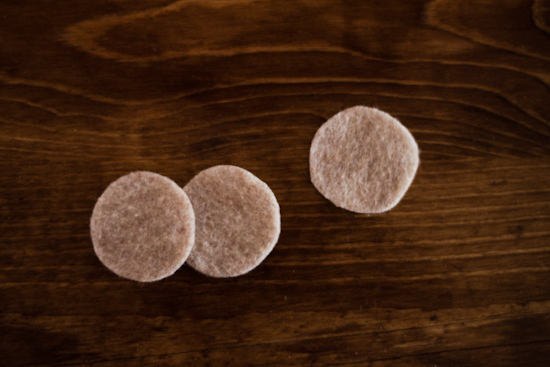 Cut another circle of felt, about 2" in diameter. 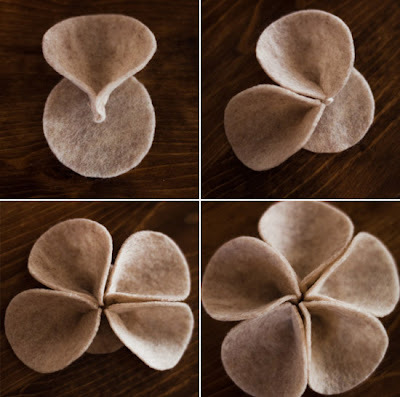 Hot glue the ends of each flower petal and place on felt circle in a star-like shape. Step 8. 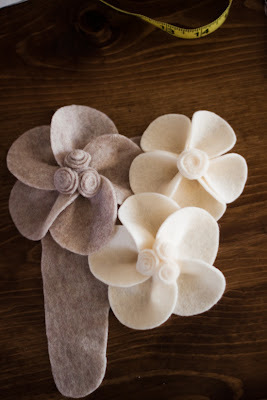 For the center pieces of the flower, cut out 3 more felt squares about 1-1/2" wide. 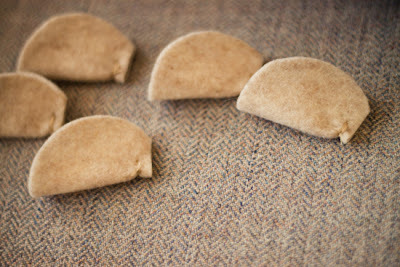 Then cut the squares into small circles. Step 9. 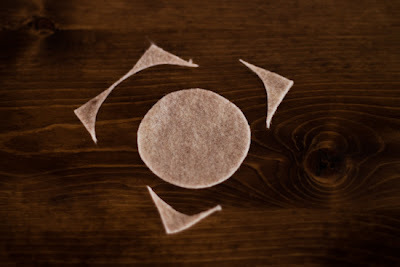 Starting from the outside of your circles, cut each one into a spiral (about 1/8" thick). Step 10. 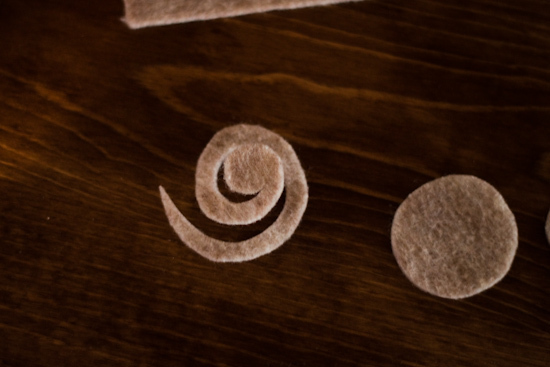 Take the outer end of the spiral and roll the felt into a cinnamon roll shape. 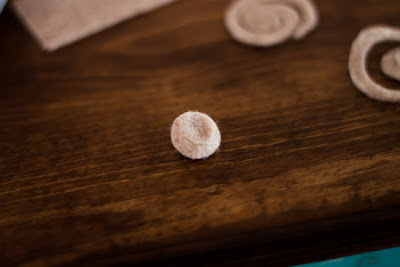 Then, place a dab of hot glue on the back and glue down the rounded piece at the end of your spiral. Repeat these steps for all 3 of your small circles. Step 11. 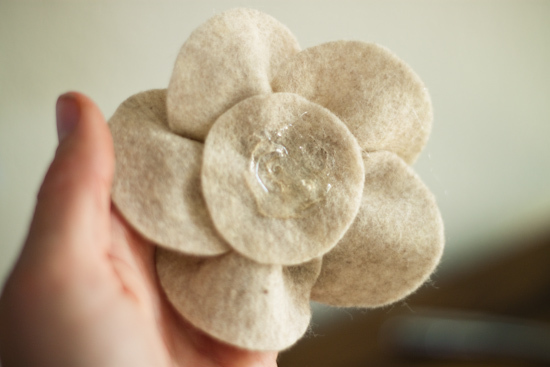 Hot glue the 3 spiral pieces to the center of your flower. Step 12. Once you have made all of your flowers, (you can make however many you want!) place them on your pillow however you please. Then take a snapshot of it, so you won't forget how you want them to lay). Step 12. This may be a little tricky but you need to sort of eyeball the shape of your flowers, and draw the out line on a sheet of paper. (you will use this as a backing for your flower pin). Step 13. Cut out your shape and pin it to a piece of felt. 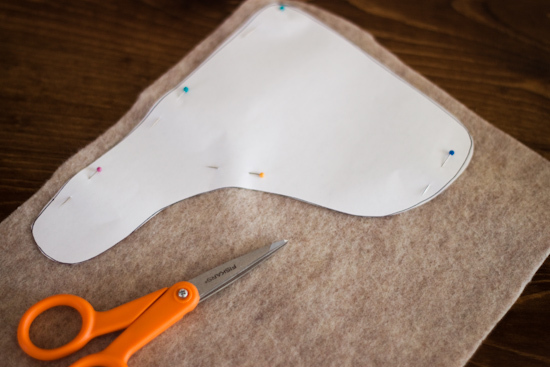 Then cut the felt using your shape as a pattern. Step 14. 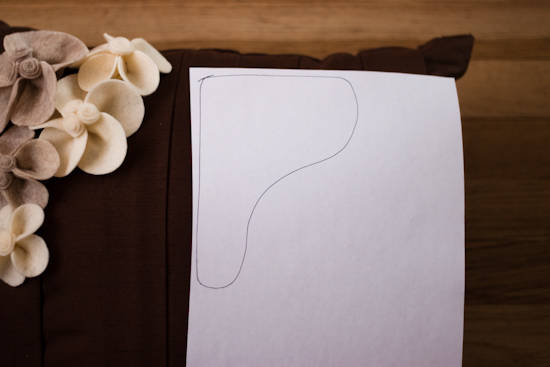 Refer to the picture you previously took and lay your flowers on the felt backing piece. Then pick 1 flower up at a time, and glue if down. 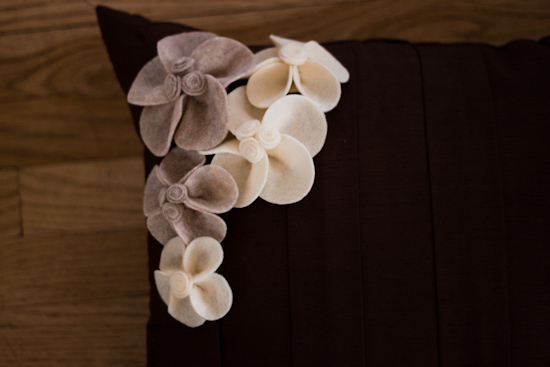 You can play with the flower petals as you glue, and overlap them in wherever way looks best. 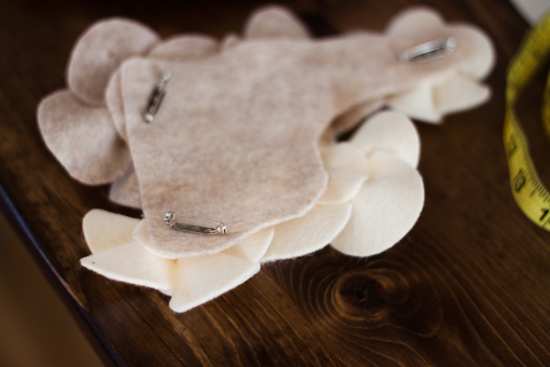 (After all the flowers are glued down you can cut away any pieces of the backing that are showing through). and hot glue them to the corners of your felt backing. 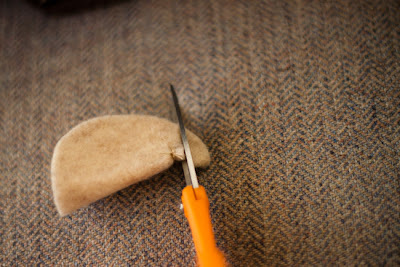 Now pin to your pillow, and your done! Can I just hire you to come makeover my whole house? those are adorable, they look great, cant wait to see you guys! 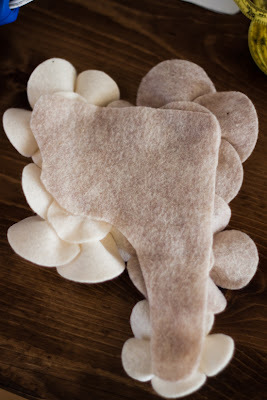 i can't wait to try this out, and maybe even make a flowered hair pin? 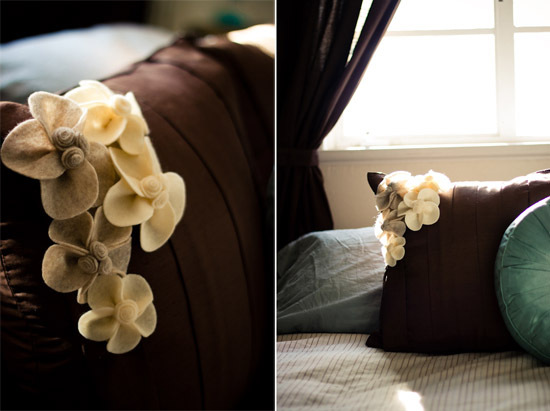 Embellished headbands are such a trend right now! Thanks for sharing this how-to! I just found your tutorial through a google search. I'm so excited to give this a try. Thank you SO MUCH for sharing!!! Love it. You are great! THIS is why I love Pintrest. 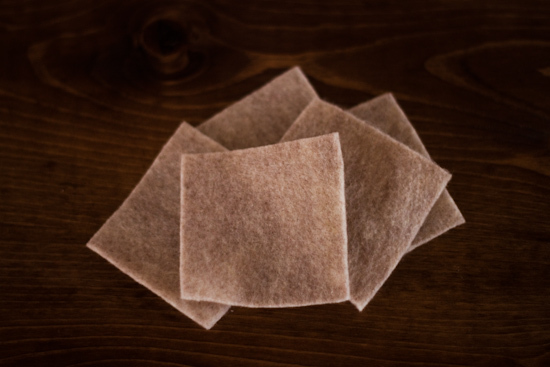 It introduces me to awesome new blogs! I LOVE these flowers and I already have plans for them. 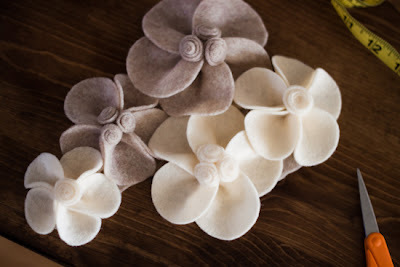 what material is used in making these flowers ? I love your idea, your creativity & it's look great! Absolutely beautiful. I am on my way to the store right now to buy the felt to try this. However, I am going to do mine about three times the size of yours. Thanks a million for sharing.